Self-styled Emperor Dragan is butchering his way across the world. It is prophesied that on the day he stops expanding his empire he will die, and so Dragan, setting his sights on his next conquest, chooses the small, poor, seemingly defenceless kingdom of Hyrkania. However, Dragan may have bitten off more than he can chew this time as he finds himself coming up against the newly crowned queen of Hyrkania, Sonja The Red. 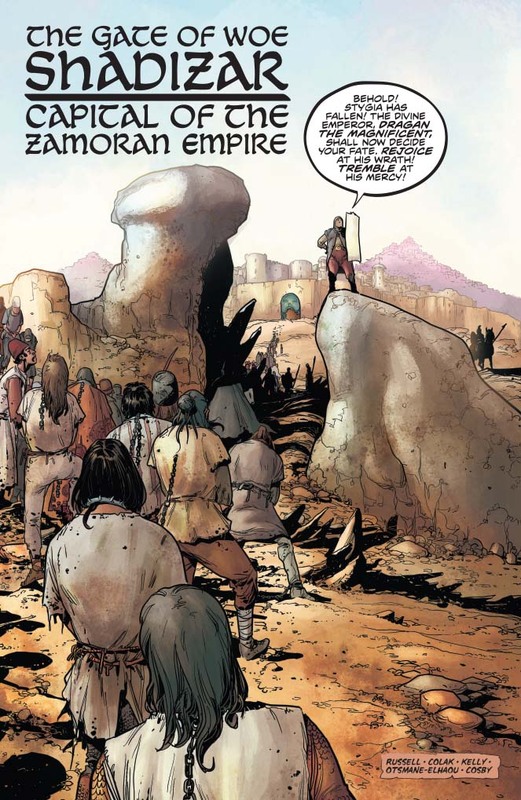 It’s great to see the resurgence in the Sword & Sorcery/Sword & Sandals genres that is happening at the moment. There have been a multitude of new titles in the genre, with Dark Horse’s Sword Daughter being a particular favourite of mine from last year, but the classics will always be my favourites. 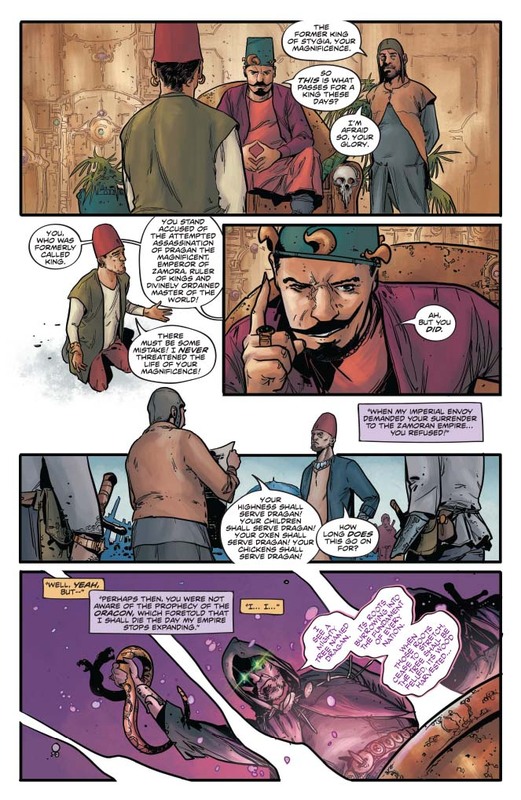 It’s great to see Conan getting some well-deserved exposure to new audiences over at Marvel, and it’s brilliant to see Red Sonja stepping back into a more mature and story driven world here with Dynamite. 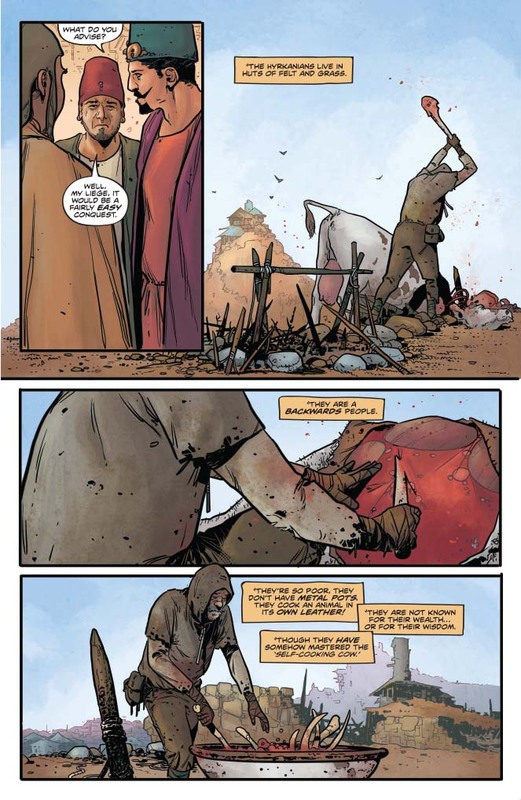 Dynamite has a long history of publishing Red Sonja, and while I have some reservations about the way they’ve handled a few of their other titles recently, it’s encouraging to see them producing a story not based purely on the amount of naked flesh they can squeeze into each panel. Mark Russell’s first issue brings us a Sonja who is a seasoned warrior with a legend that precedes her, coming across as clever, cunning and merciless in a fight. 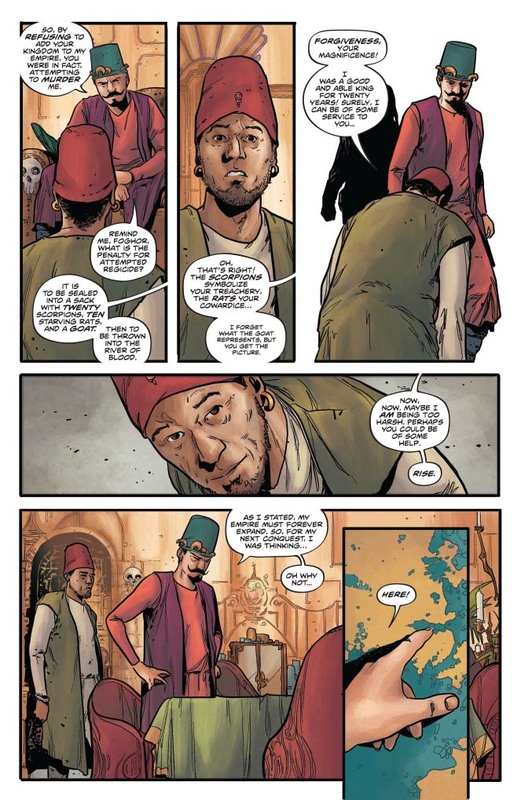 The world Russell gives us in this issue is not as bleak as it could be, and in some respects that works well. There’s a fatalistic humour throughout that I kind of enjoyed but I felt that sometimes it overpowered the story, dragging it into more of a fantasy humour genre. The best/worst example being the letter to Hyrkania from Dragan entitled “So you’ve decided to join the Zamoran Empire”. This was just a step too far for me, and with some of the dialogue being too modern for the genre, I almost expected to see Jason Statham appear in a cameo or a credit to Guy Ritchie at that point. The basics are done right, it’s a solid premise and I thought Sonja was portrayed with much more thought than I’ve seen in other series. On the whole I really enjoyed the story I just think it needs to dial back on the humour a bit. 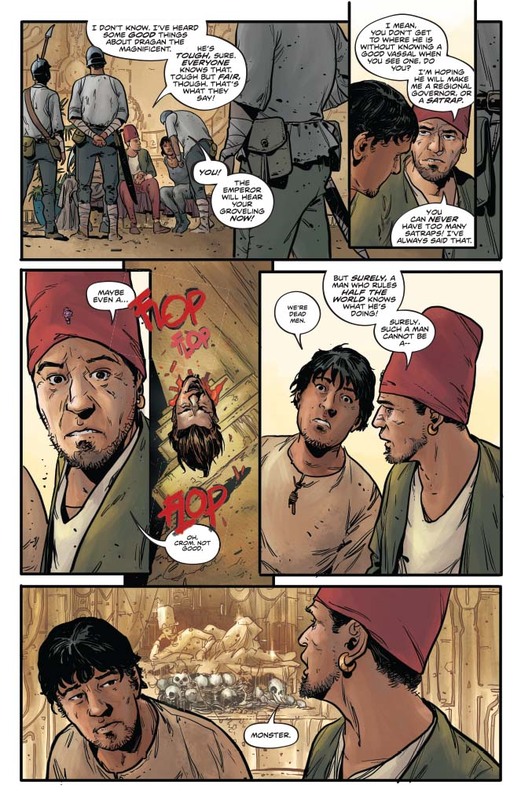 I really enjoyed Mirko Colak’s artwork and Dearbhla Kelly’s colouring throughout. The action sequences are well paced, economical and brutal, which is exactly how they should be. It’s also great to see Sonja depicted as a warrior and as someone with a brain in her head, not to mention a realistically proportioned woman who managed to remain clothed throughout the issue. There are some nice touches in the colouring too, especially the way the action scenes are highlighted, and I liked the panel layout that made the action seem faster-paced as the shapes and sizes changed. I’m sure at some point we’ll see the traditional fish-scale bikini armour that she’s known and loved for, but just for a moment at least we can have a story that concentrates on her achievements rather than her assets. 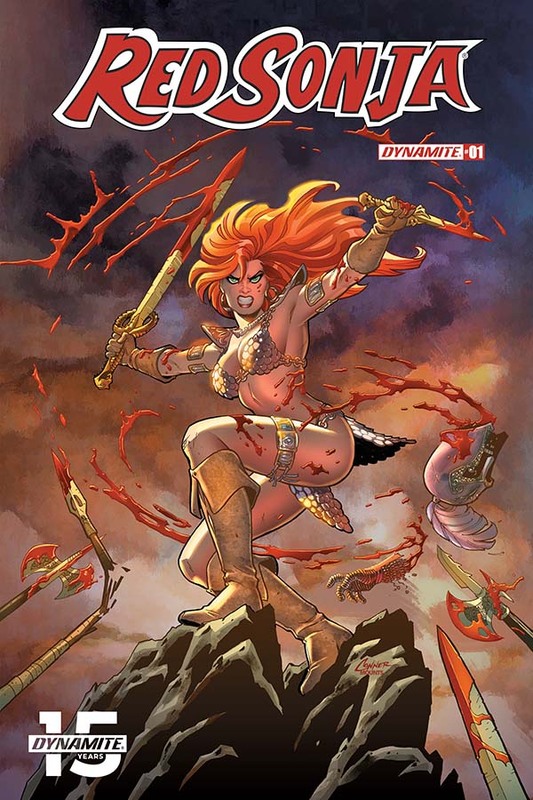 Red Sonja will always remain a firm favourite of mine, and I’m always eager to see new titles in the series. Whilst this issue certainly has its flaws, it’s a good start and I think, if you’re a Red Sonja fan, this is going to be a series that’s well worth your time and money.